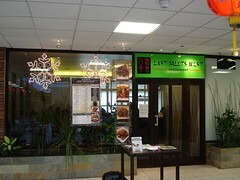 East Meets West was a Dongbei (North-East Chinese) restaurant in the Wing Yip complex in Croydon. It has now closed. As of November 2018 the unit is vacant with a forfeiture notice in the window. Dongbei (North-East Chinese) restaurant in the Wing Yip complex in Croydon. It opened in late 2013. It also does takeaway and delivery. Kake has visited a couple of times now, in the company of various friends. On a Saturday lunchtime in January 2014, it was almost empty when we arrived a little before 12:30pm, but an hour later it had filled up, though there were still a few free seats. On a Sunday evening in February 2014, there was only one other party when we arrived, and no others turned up while we were there. Music was playing on both our visits, not too loud, but a little cheesy at times (and bizarrely featuring Christmas music on our February visit). Sliced potato with sweet & chilli sauce (熗拌土豆絲; £5 in Jan 2014) photo was a generous portion, served cold and refreshing, with the potato retaining the crunchy texture characteristic of this dish. Another cold dish, preserved egg and tofu salad (農家皮蛋豆腐; £7.50 in Jan 2014) photo was also nicely done, using a relatively coarsely-textured tofu to ensure that the flavourful sauce penetrated well. Moving on to hot dishes, stewed green pepper, potato, and aubergine (地三鮮; £7 in Jan 2014) photo had a richly savoury sauce, and lovely texture on the deep-fried potatoes, though the aubergines were perhaps verging on too soft. Fried pak choi with Chinese mushroom (香菇油菜; £7 in Jan 2014) photo was fine. Sauteed shredded pork with sweet and spicy garlic sauce and bean curd sheets (京醬肉絲; £7.50 in Feb 2014) photo was a savoury tangle of shredded pork in a dark sweet sauce, served on a bed of shredded spring onions with beancurd sheets to wrap it up in. Although the restaurant specialises in Dongbei food, it also does some Sichuan dishes. Of these, we've tried three: Sichuan shredded pork with spicy garlic sauce (四川魚香肉絲; £7.50 in Jan 2014) photo, Sichuan chicken salad with chilli oil (口水鷄; £7.50 in Feb 2014) photo, and Sichuan style spicy noodles (擔擔麵; £4.50 in Feb 2014) photo. These were generally competently prepared, but sweeter and less spicy than they would have been at a restaurant specialising in Sichuan food. The chicken was also lacking in umami, and the noodles were a little too soft and lacked sufficient chilli oil. The staff were happy to give advice on which dishes were suitable for the vegetarians in our party. They were also careful to check that the non-Chinese members of our party had eaten preserved egg before. Our final bills photo from Jan 2014, photo from Feb 2014 included auto-added 10% service charge. Not counting drinks or service charge, and correcting for an undercharge in January 2014, our food came to £10.50/head in January 2014 and £15/head in February 2014. Kake's verdict: I've been several times now and have plans to come back and try the rest of the menu — though this is partly because it's the only place in Croydon doing this type of food, and I've been missing having it locally since I moved here. I think I'd stick to the Dongbei dishes on future visits, since I prefer my Sichuan food spicy. Child-friendliness: They have at least one high chair (which was in use during our first visit). Accessibility: Step-free entrance to the Wing Yip building and the restaurant, and no steps inside the restaurant either. There is an accessible toilet and step free to the others. Food last sampled by Kake and bob, April 2018 (takeaway delivery). Last visited in person by Kake, bob, Ewan, Kat, et al., April 2014. Last edited 2018-11-22 15:08:20 (version 15; diff). List all versions. Page last edited 2018-11-22 15:08:20 (version 15).